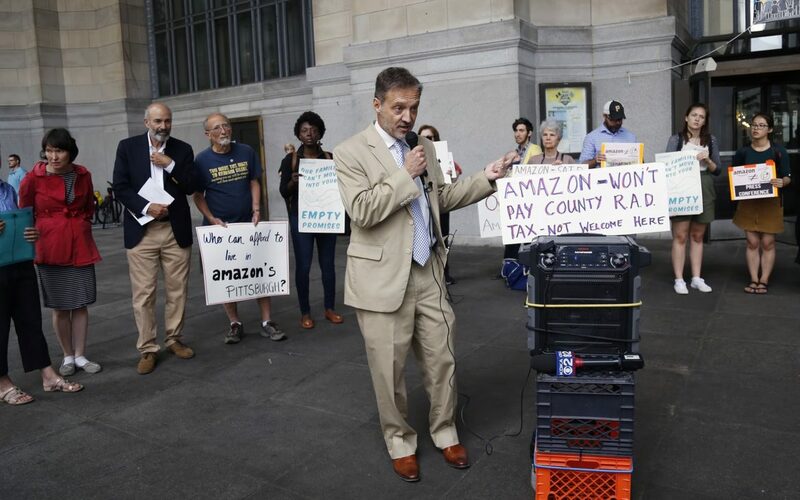 A community activist group announced Thursday that it filed an amicus brief on behalf of several news organizations, including PublicSource, that are fighting in court to make Pittsburgh’s Amazon HQ2 bid and related documents public. The American Civil Liberties Union in Pennsylvania, among other groups, has signed onto the amicus brief. ACLU Legal Director Vic Walczak said on Thursday to about a dozen people gathered in front of the City-County Building Downtown that Amazon would cause “an earthquake of unprecedented magnitude for this region.” He said everything from housing to the local economy to local politics would be affected. The protesters in attendance called on Pittsburgh Mayor Bill Peduto and Allegheny County Executive Rich Fitzgerald to release details of what the city offered the online retail giant to lure it to Pittsburgh. Both have declined to do so, saying they’ll release the bid once Amazon makes its final decision and that the public will have its chance to weigh in. 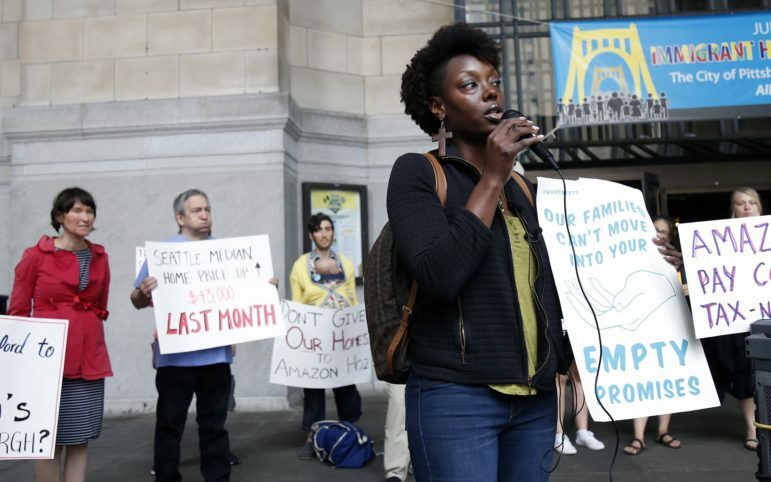 The amicus brief, filed by the Community Power Movement, argues that the refusal by the city and county to make the Amazon proposal public is “unlawful.” Using Pennsylvania’s Right-to-Know Law, PublicSource and other news outlets requested the city and county release the bid and details on incentives offered. The city submitted its bid on Oct. 19, and PublicSource’s open records requests were filed the next day. Amazon named Pittsburgh as one of 20 finalist cities for the HQ2 location in January. The brief says the open records law makes it clear that the bid is a public document and that members of the community have a stake in knowing what’s in it. The Office of Open Records has also deemed the bid and associated materials to be public. Jackie Smith, a University of Pittsburgh professor and organizer of Thursday’s event, studies economic globalization and its impact on communities. She said Amazon fits into a trend of large companies amassing power and using that power to win favor with governments. Those same large companies, she said, also cause people to be displaced when they move into communities. “We're seeing less and less democracy in our society and the only way to get it back is to fight these kinds of struggles and to get more people involved in doing the hard work of finding out information,” she said. Other community groups signed onto the amicus brief, including: the Thomas Merton Center, Hazelwood Initiative, Urbankind, Pittsburghers for Public Transit, Pittsburgh Human Rights City Alliance and Penn Plaza Tenants Association. 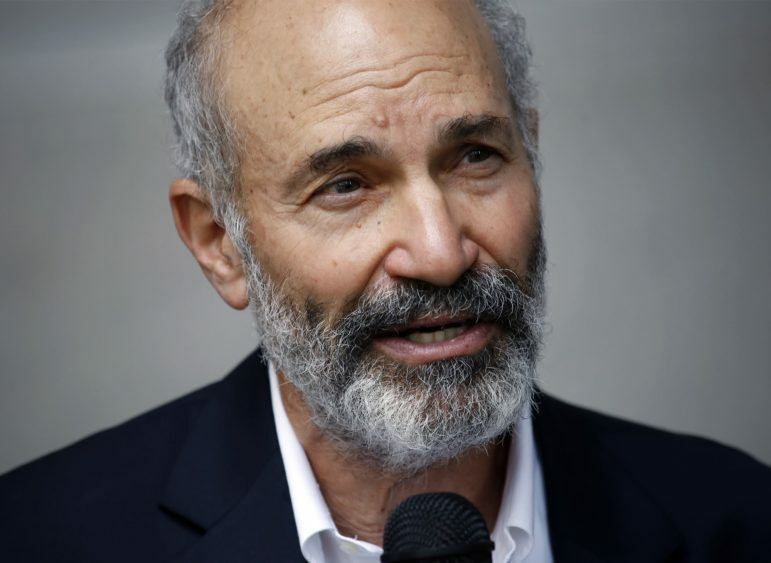 Jules Lobel, chair of the University of Pittsburgh’s law department, was the main drafter of the amicus brief, along with some students. He said calling on local leaders for transparency is important because their decisions can change communities. But doing so is also a way to hold Peduto accountable for his promise to run a transparent city. “This is what Peduto promised that he was going to do when he was elected mayor, but unfortunately, he is not complying with his promise,” Lobel said. Gov. Tom Wolf’s administration is also currently appealing in Commonwealth Court to prevent PublicSource from obtaining documents about the incentives the Department of Community and Economic Development offered to Amazon. Those incentives are currently estimated to be about $1 billion. Others in attendance Thursday spoke about how Amazon could displace residents.They argued that HQ2 would drive up housing and rent costs and force people to move outside of the city, where they would be farther from doctor’s offices and bus lines. “People get pushed out to transit deserts. They're not going to be able to get to food, to work, to child care,” said Crystal Jennings, an organizer with Pittsburghers for Public Transit and the Penn Plaza Support and Action Coalition.